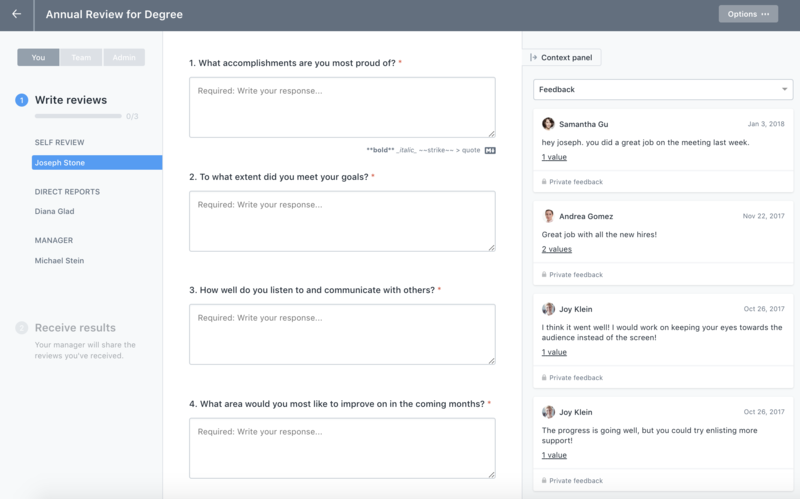 This article walks through the review stages as well as email notifications that you and your employees should expect during a 360 review. 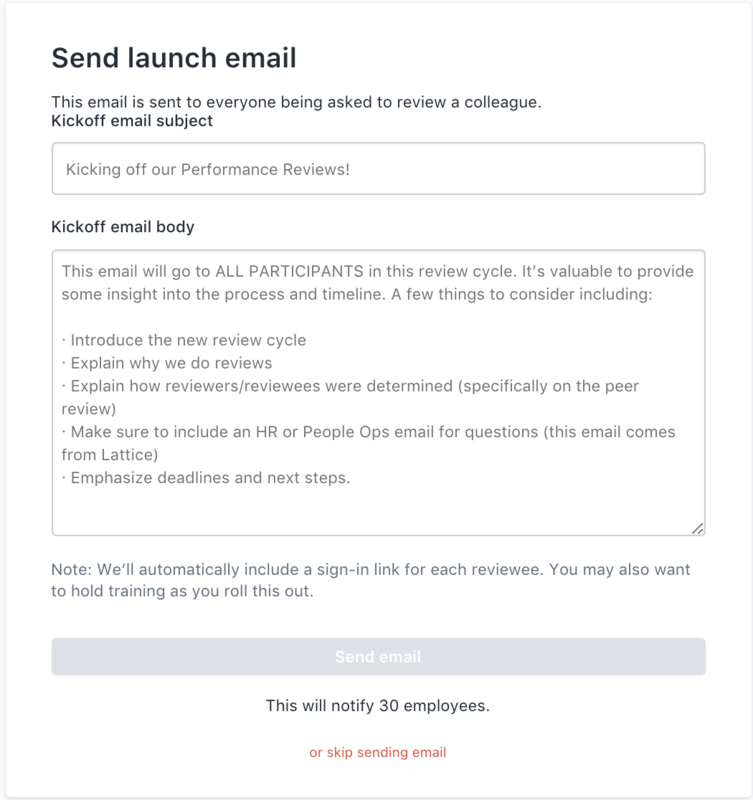 Once the cycle is verified, you'll be prompted to send out a kickoff email. This email will either go out to managers or ICs depending on how you've chosen to do peer selection. The email is completely customizable. Below are a few examples of what employees and managers could see. If you don't want to send this email, you have the option to "skip sending the email." 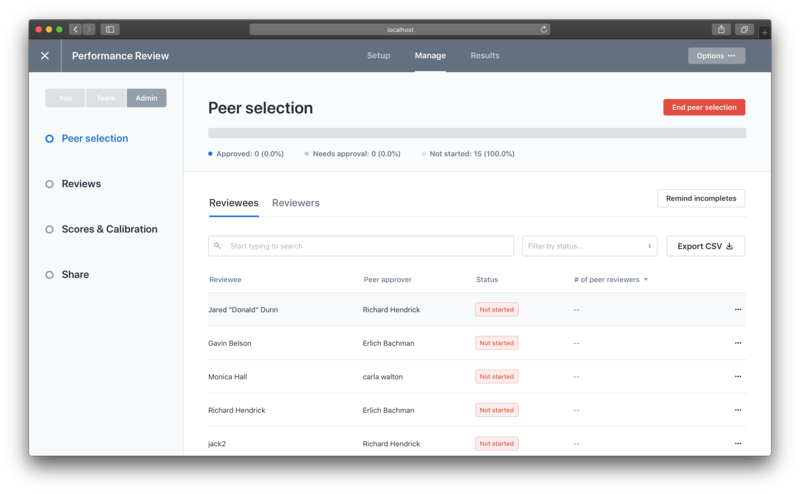 This will automatically launch the review into the peer selection process. Administering Peer Selection goes through how the peer selection process works. If you want to remind managers or employees to finish their peer selection, you can click "Remind incompletes." "Remind incompletes" will send the above email to anyone who hasn't selected peers. 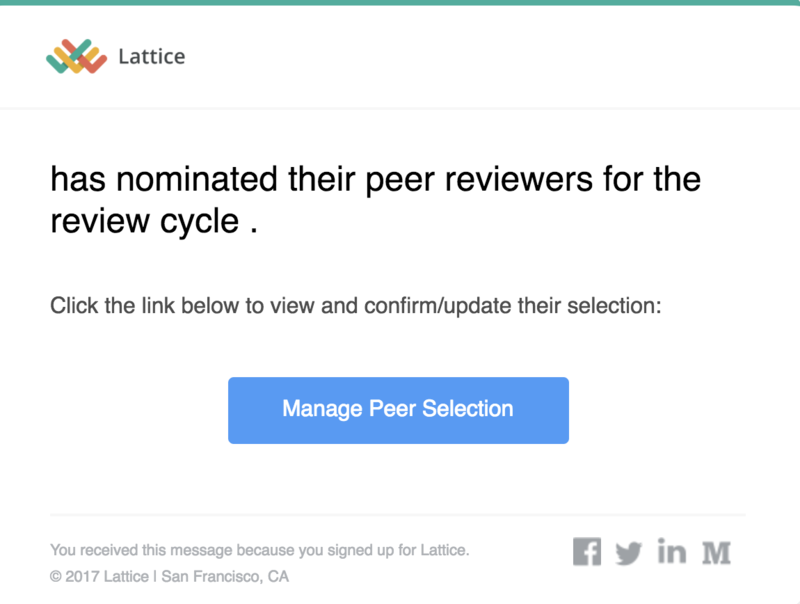 If they have selected peers, an email will go to their managers prompting them to approve those selections. You'll be notified when peers have been selected and confirmed, and the review is ready to be kicked off. 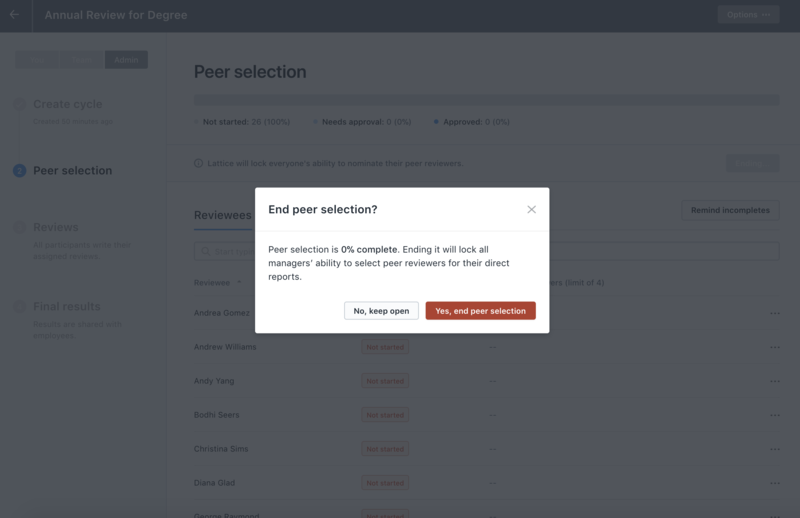 Next click "End peer selection." 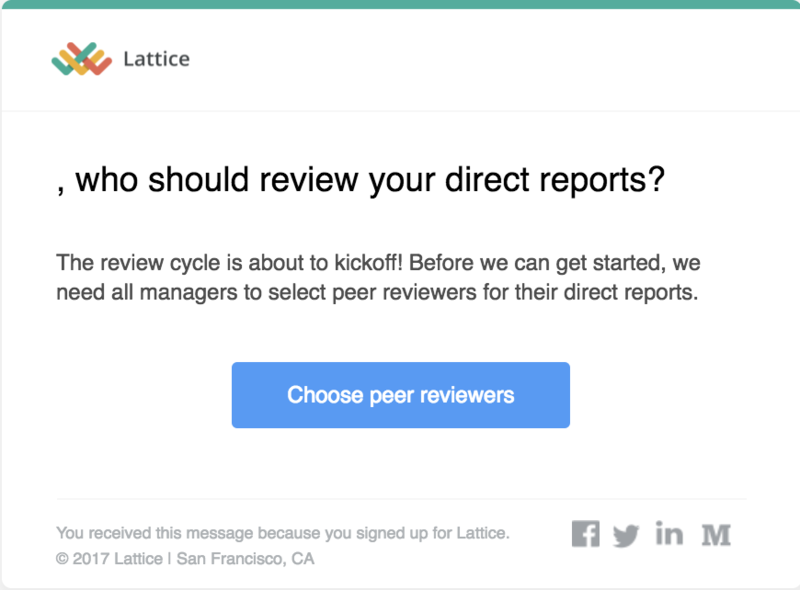 Once you end the peer selection process, you will not be automatically launched into the review. 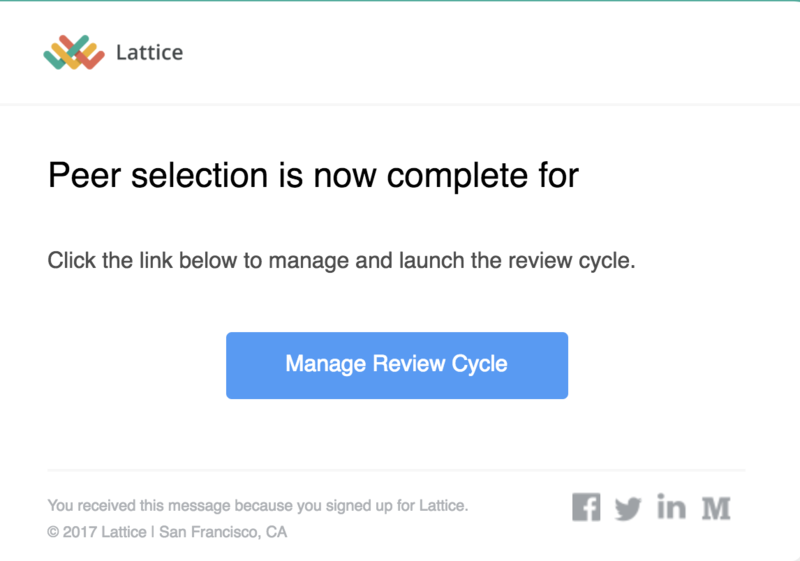 You will be taken to a page where you get to choose to send a kick-off email through Lattice if you'd like. 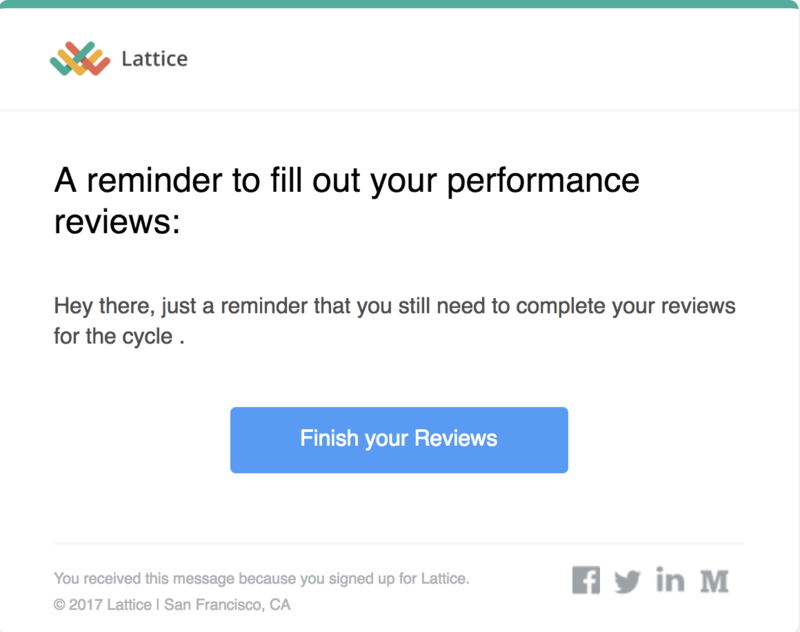 If you send this email, everyone completing a review will receive an email prompting them to do their reviews. 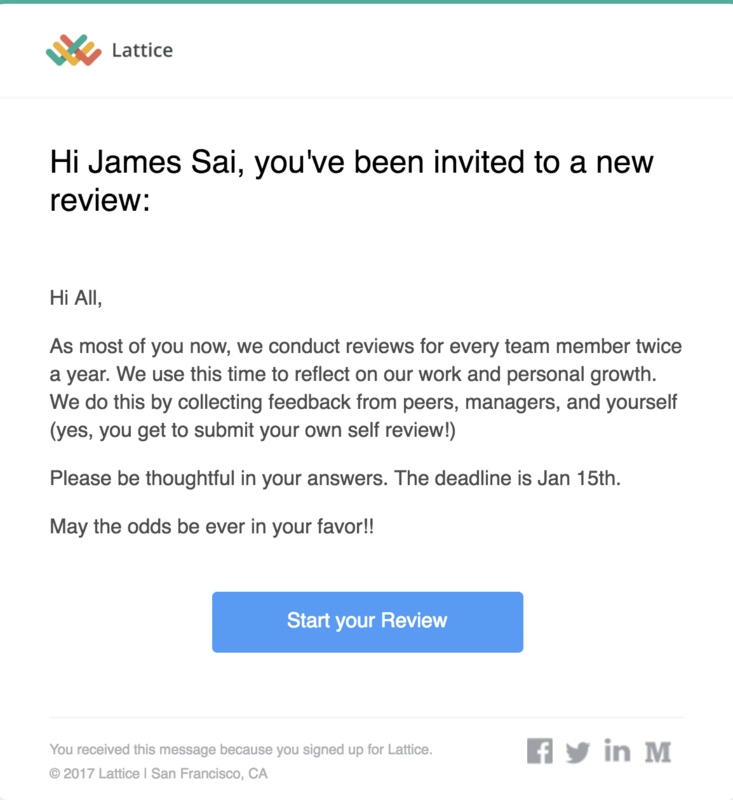 After this kickoff email is either sent or skipped, everyone who needs to complete a review will see a task notification on their You page prompting them to fill out their reviews. 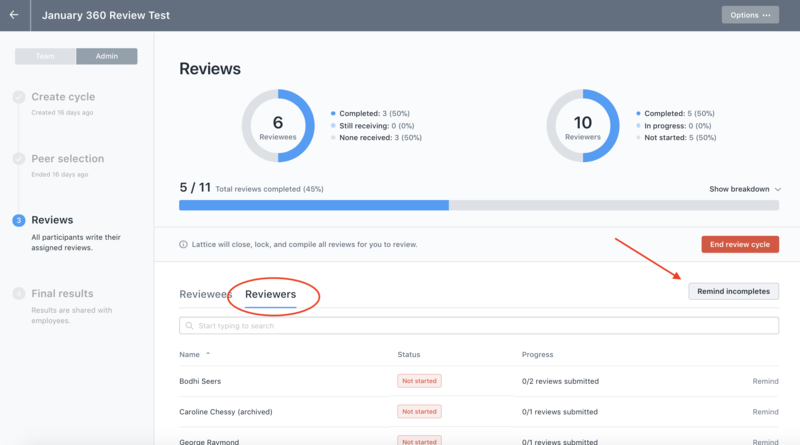 As employees submit their reviews, you might want to remind employees who have not yet completed their reviews to take time to do so. 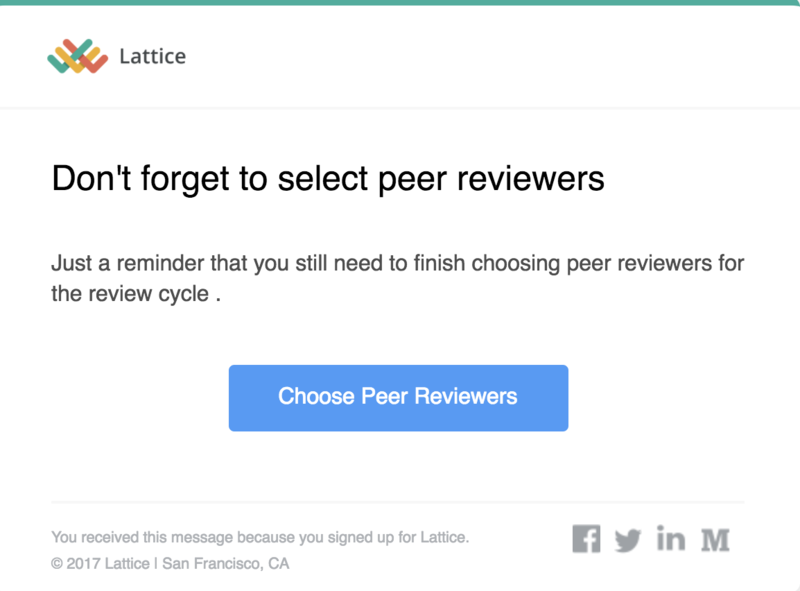 To send them a reminder email, click into the Reviewers tab, and then "Remind incompletes." 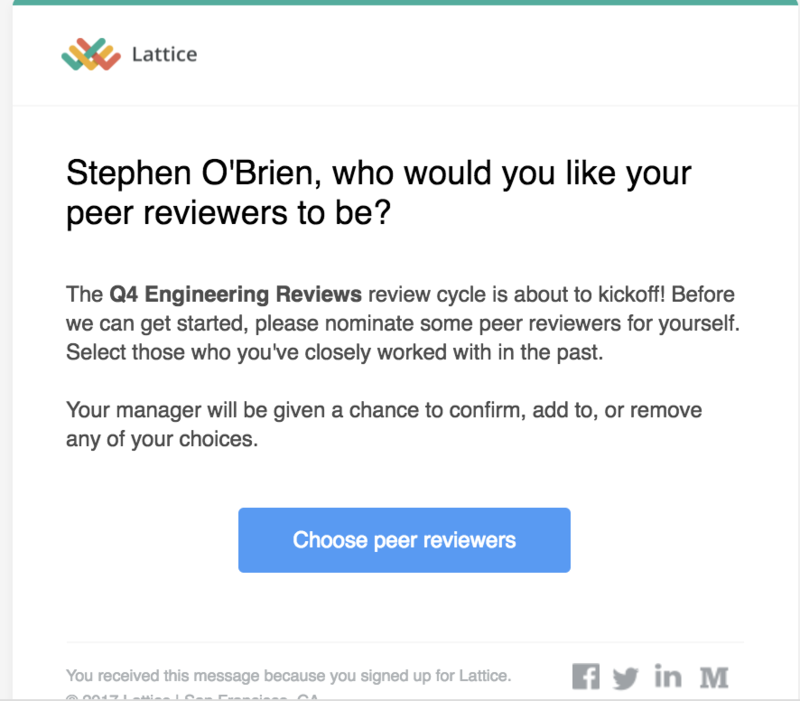 You also may have forgotten someone as a reviewer and want to add them into the review mid cycle. This article explains how that is done. The employee will also receive an email letting them know they've been added as a late reviewer. 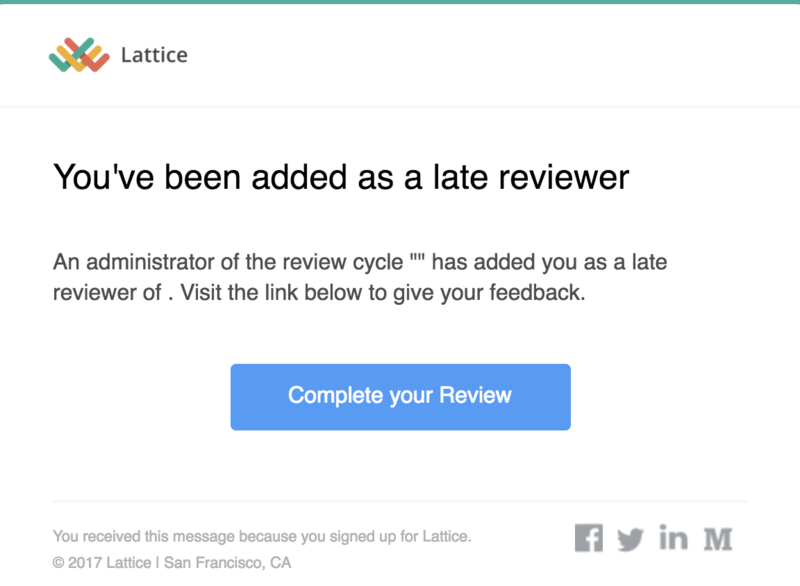 When your reviews have been completed, click "End review cycle" to move the cycle to the next stage. 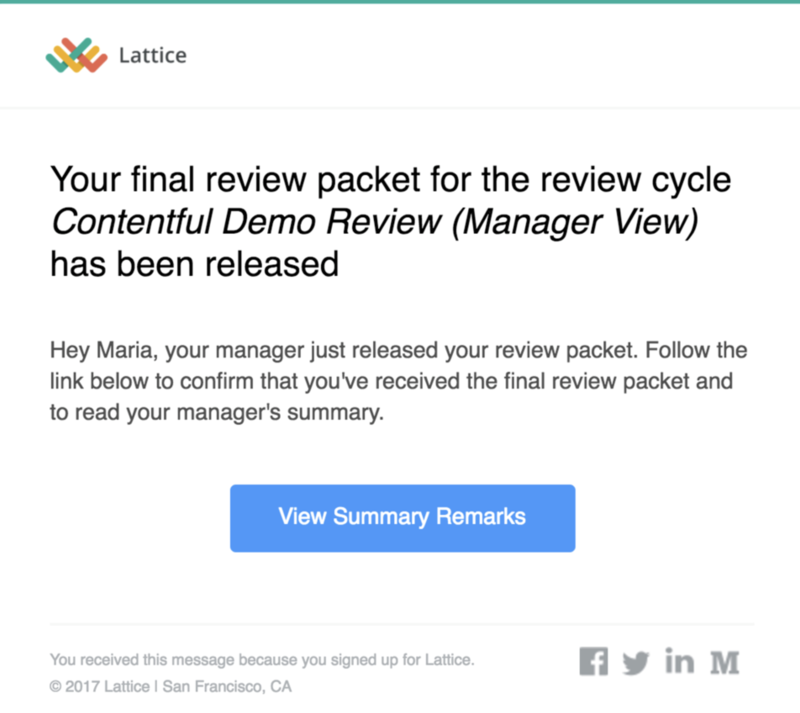 Once you've ended the review cycle, managers receive a notification prompting them to view the responses/packets of their directs reports. 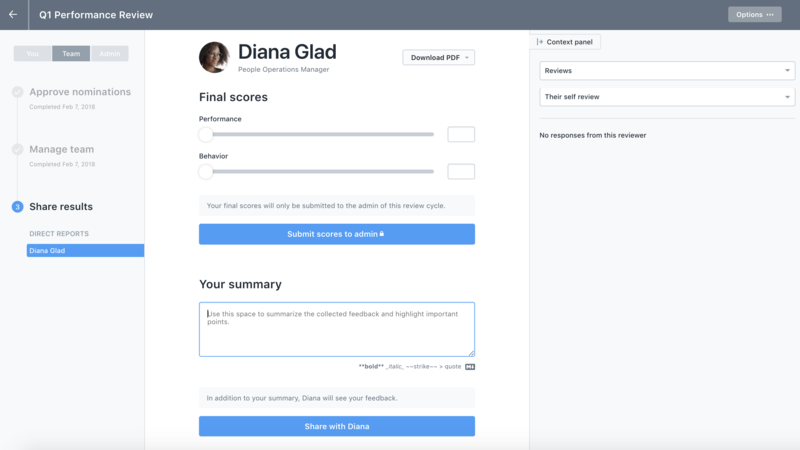 The manager will also receive a notification on their You page prompting them to "Finalize your report's review packets." 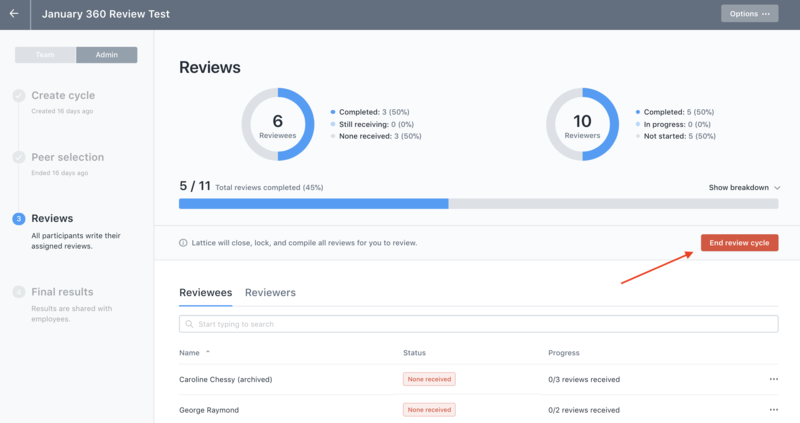 The manager will click into the task and see the review packets of their direct reports. They'll be prompted to submit final scores (if they've been turned on) or final summary remarks. This might be a good time for managers and direct reports to meet and discuss the review packet contents. If the manager wants to write draft summary remarks and download the Employee view PDF, they can do so here *without* sharing the packet. 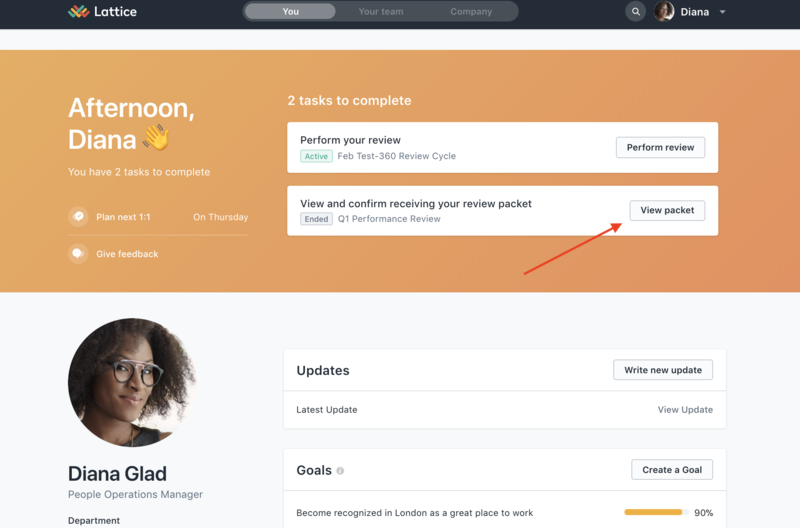 When a manager decides it's time to share the packet with their direct report, the direct report will receive a notification to view their responses. They'll also see a task on their you page. 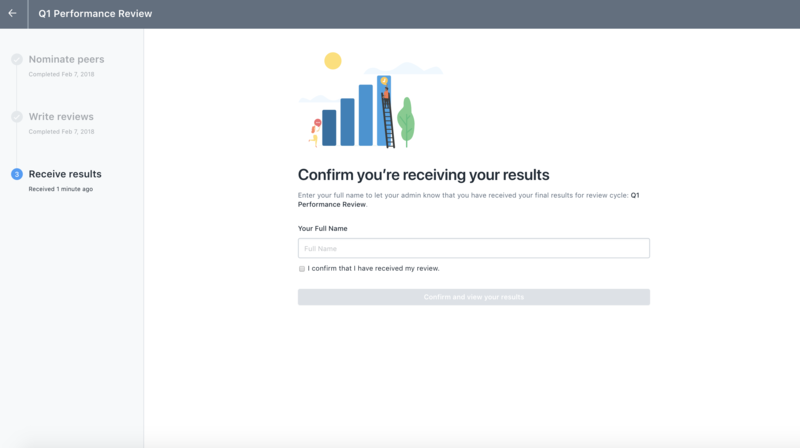 Clicking into this task will bring them to a e-confirm page. 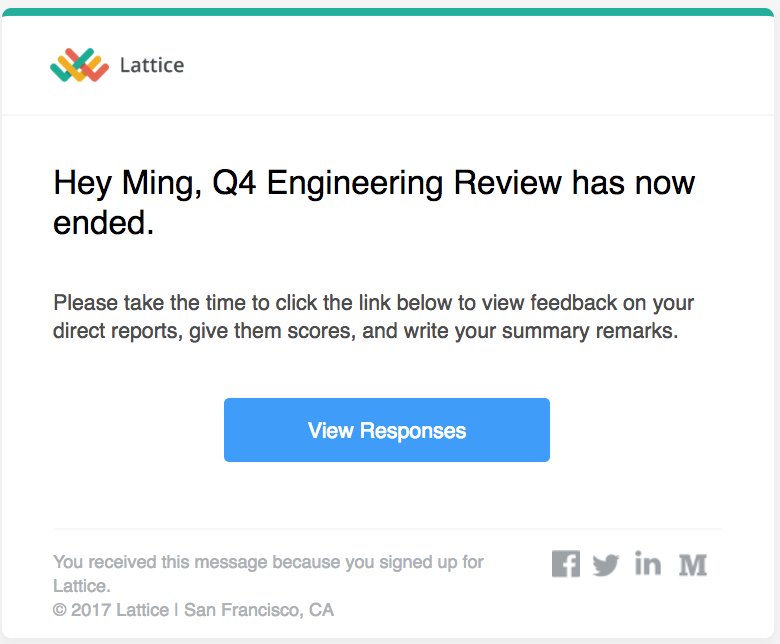 When the direct report opens and e-confirms, managers will receive an email notifying them that their direct report opened it. As always, let us know if you have any questions. For more information on emails, they're listed below.